There are several unique lodging options throughout the city. Hotel Condesa DF is a crowd favorite in the charming neighborhood of Condesa. The hotel is somewhat dated, but still manages to deliver a unique experience with a lively rooftop bar and open air courtyard restaurant. Tip: Ask for a room with a terrace, but bring earplugs; the noise from the roof can be bothersome. Pug Seal has two unique options in the posh Polanco area. Both Tennyson and Allan Poe are housed in former mansions with cozy rooms in quiet residential areas. Guests will find a local smartphone in their rooms to take on their daily adventures. The Four Seasons is a large property, but manages to deliver an intimate experience. The beautiful courtyard is the perfect place to plan your day over a plate of Chilaquiles, or spend the afternoon relaxing with a cafecito from the charming lobby coffee shop. The location is perfect for exploring Chapultepec Park and numerous museums, all a pleasant 15 minute walk away. It also puts you in prime position to explore Roma Norte, about 10 minutes walking. 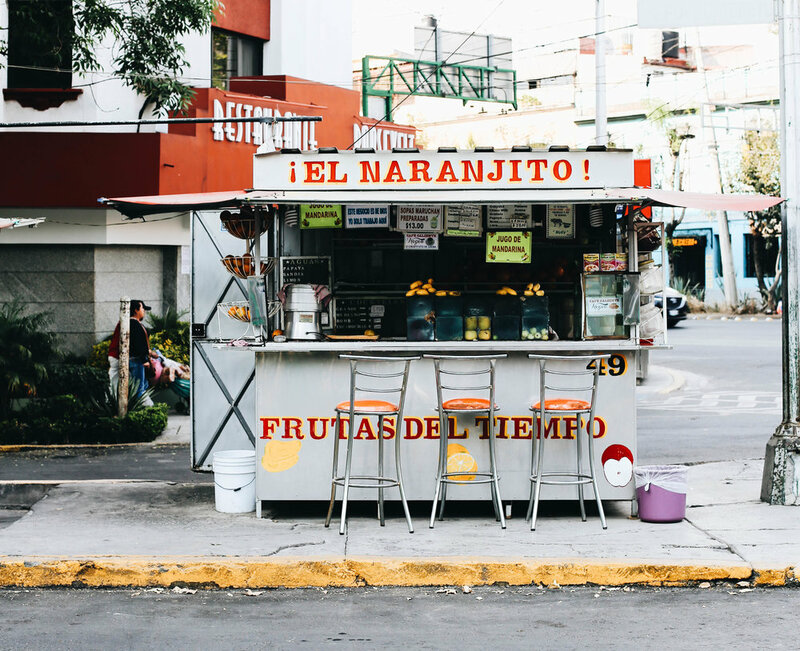 There is no shortage of good food in Mexico; from the humble street taco to high-end haute cuisine, there is literally something for everyone and every budget. If you’re interested in exploring the food markets and street side stalls, bring cash. If you’re looking for a more refined experience, be sure to make reservations well in advance. Pujol has made it’s mark on the Mexican fine dining scene with a head chef (Enrique Olvera) who is synonymous with modern day Mexican cuisine. The restaurant is housed in a stunning, Japanese style setting complete with a tranquil garden, perfect for enjoying a cocktail before dinner. The prix-fix menu is one of the most expensive in the city, but consistently ranks as one of the most well regarded restaurants in the world. The new addition of the 10 seat bar serving a “taco omakase” menu makes competition for reservations even fiercer. We weren’t lucky enough to score a reservation, but tried our luck walking in. From time to time, this works, but a reservation is really your only surefire way in. Tip: If you can’t score a seat inside, the outdoor garden is open for cocktails and they serve a secret, off-menu (and out of this world delicious) cheese plate. Just down the road from Pujol, Quintonil is another restaurant making waves in the world of modern Mexican. Ranked among the best restaurants in the world, guests can choose from either a multi-course tasting menu or Ala carte. Tip: We did manage to walk in here without a reservation, so if you’re willing to eat quite early or quite late, you may have luck doing this. Huset is another Roma Norte favorite housed in a beautiful former casona with a charming courtyard. The food here was thoughtful and straightforward, but delicious (think avocado pizza). Don't miss the exciting cocktail list...my favorite was a riff on a margarita with smoked jalapeño. Blanco Colima is a solid choice for brunch, afternoon cocktails or dinner. The building itself is gorgeous and the decor is modern and fresh. Next door, Rosetta is a beautiful, airy space serving Italian. The food here can be hit or miss, but the nearby panaderia is outstanding. There are several outposts of El Moro Churreria (including one in the buzzy food hall Mercado Roma, which is also home to a cheerful beer garden). Find one, and enjoy a combo of freshly made churros dusted in cinnamon sugar and big mug of hot, thick dipping chocolate. They've been around since 1935, but their modern and bright cafes are totally on trend. Los Danzantes (located in Coyocan) is a great option for lunch if you're in the neighborhood visiting The Frida Kahlo museum. The food here is traditional with a twist and the margaritas are delicious. Contramar is only open for lunch, so you’d better not miss your chance to eat here. It was our favorite meal of the trip and with a seafood focused menu, felt light and fresh. The tuna tostadas are famous, but the service should also get high marks for being amazingly efficient and warm. Save room for the fig tart. Tip: Without a reservation, you’ll need to get there a little before opening time and queue up. Make sure to ask for a table outside; the inside is full to the brim and slightly claustraphobic. The Anthropology Museum is quite popular with a beautiful central fountain. Both The Frida Kahlo Museum and Diego Rivera Studio are located just a bit out of central Mexico City in Coyocan. Tickets can be purchased online, otherwise you'll need to arrive early and hope to grab a slot. About 40 minutes outside of CDMX, the Pre-Hispanic city of Teotihuacan. It's a UNESCO designated site and quite popular with tourists, so be prepared for crowds. Casa Luis Barragan is extremely popular with very limited space, reservations are essential. Uber is widely available and extremely inexpensive. The city is quite walkable and while there is public transportation (subway and buses), it's not the safest option for visitors. If you are taking a taxi, ride only in the hot pink official CDMX taxis, not the Volkswagen Beetle taxis; those do not have radios and are therefore unregulated. While credit cards are accepted at more established restaurants, you'll want cash for markets and street tacos. US dollars are accepted, but the exchange rate is more favorable if you just have Pesos handy. Mexico City is relatively safe, but it's still an urban environment and it's always best to leave flashy jewelry at home. When out walking, keep your bag zipped and wallet in your front pocket.